This test measures your ability to understand conversations and lectures in English.The Listening section is divided into 2 separately timed parts. In each part you will listen to 1 conversation and 2 lectures. You will hear each conversation or lecture only one time. After each conversation or lecture, you will answer questions about it. The questions typically ask about the main idea and supporting details. Some questions ask about a speaker’s purpose or attitude. Answer the questions based on what is stated or implied by the speakers. You may take notes while you listen. You may use your notes to help you answer the questions. Your notes will not be scored. If you need to change the volume while you listen, click on the Volume icon at the top of the screen. In some questions, you will see this icon: This means you will hear, but not see, part of the question. Some of the questions have special directions. These directions appear in a gray box on the screen. Most questions are worth 1 point. If a question is worth more than 1 point, it will have special directions that indicate how many points you can receive. You must answer each question. After you answer, click on Next. Then click on OK to confirm your answer and go on to the next question. After you click on OK, you cannot return to previous questions. A clock at the top of the screen will show you how much time is remaining. The clock will not count down while you are listening. The clock will count down only while you are answering the questions. Question 1-5: Listen to a conversation between a student and her professor. 1. Why does the woman go to see her professor? 3. Why does the professor talk about an observation he made In his chemistry classes? 4. What does the professor suggest the woman do? 5. What can be Inferred about the woman? A. She does not like chemistry. B. She is too busy to study. C. She does not agree with the professor. D. She was careless about lab technique. Question 6-11: Listen to part of a lecture from a neuroscience class. 7. Why does the professor mention diabetes? 8. Which of the following are mentioned as body parts that can cause blockage of the windpipe? 9. According to the professor, what should a sufferer of sleep apnea try at first In order to reduce the symptoms? Listen again to part of the lecture. Then answer the question. 11. According to the lecture, what does CPAP stand for? 13. Why does the professor mention how the hydrogen bomb is built? 14. According to the professor, why is fusion in general so difficult to achieve? A. Atoms are not magnetic enough. B. Plasma needs so much room. C. It is impossible to compress heat. D. Tritium and deuterium are too heavy. 15. According to the professor, why do atoms not get trapped in a magnetic field when they are In a superheated state? 17. According to the professor, what event sparked great Interest in cold fusion in the science world? 18. What are the speakers mainly discussing? 19. What does the woman suggest the man do? 20. According to the woman, what advantages does the library’s database have? A. Number of magazines available is unlimited. B. Extent of research can be determined. C. Applicability of results to research is rated. 21. What does the woman Imply about the results of the search? A. They are either in the French or German language. B. They are probably not relevant to the man’s topic. C. Not all of them will be useful to the man. D. The man must check them to make sure they are about France or Germany. 22. What will the man probably do next? Question 23-28: Listen to a talk on art The professor is discussing the Aitamira Cave. 23. What does the professor mainly discuss? 24. What does the professor say about the Altamira Cave? A. It had been partly destroyed when its bedrock was dissolved. B. It was once occupied by the Solutrean and Magdalenian at the same time. C. It had previously been inhabited by both people and animals. D. It collapsed during a rockfall that occurred 13,000 years ago. 25. In the lecture, the professor describes features of some of the Altamira Cave paintings. Indicate whether each of the following Is a feature of the paintings. Click In the correct box. 26. What can be inferred about the Altamira Cave paintings? A. They were proved to be authentic. B. Their genuineness is still under question. C. They had been painted by a 19th century artist. D. They wore better than cave paintings in France. 27. Why does the professor mention the Stone Age? 28. What is the author’s opinion of the theories on who did the paintings? D. They are not indisputable. Question 29-34: Listen to a talk on biology. The professor is discussing animal defensive behavior. 29. What Is the main idea of the talk? 30. Why does the professor mention human goals? 31. What does the professor imply about violent behavior in animals? A. It does not occur unless it is provoked. B. It is seldom expected in most animals. C. It is typical even with smaller animals. D. It is not certain which animal will become violent. 33. The professor describes how certain animals defend themselves. Indicate for each animal a characteristic manner in which he defends himself. Click In the correct box. 34. What is the professor’s attitude toward animals that feign death? A. They are bad actors. Hi, first of all thank you very much for a great material but can you tell me please when I can find key for this listening ? Thanks in advance. could you send me the answer key in my email? I just have sent Solution for TOEFL IBT Listening Practice Test 26 from TOEFL iBT Navigator to you, please take a check! Hi, Can you please send me the key as well. Hi Ishan Gupta, i just have sent email to you, please take a check! I couldn’t find the keys as well, thanks in advance. Hi..Can you validate my answers below or please send me the key. Thanks for all the help. Hi Wiki, Could you email me all answers of listening practices. Where can I get answers to this section? Hi..Can you please provide answer key to this. Thanks. thank you for this great material, do you have the transcripts? Hey…its really worth doing this practice test..it would be more helpful if you provide answers too..
Could i have the answers please? do you send the answer? Hi, thank you very much for a great material but can you tell me please where I can find key answers for this listening ? Thanks a million Wiki Toefl for these beneficial materials , But how can I find the key answers for listening tests ? 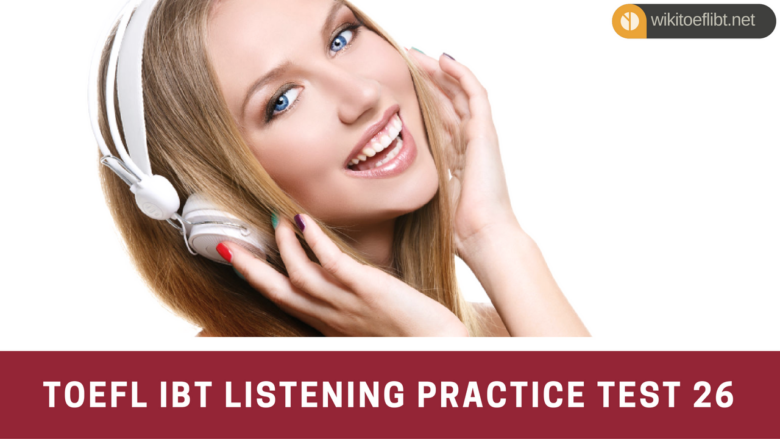 I would love to try these listening exercises, but would like the answers before spending time doing the work. Can you email the answers to all the listening exercises please? For me too, the answers of all the listening exercises. Thanks. May you send me the correct answer of this test. Could you please send me the answers? Can u plz provide the answers for these questions ? Hello Author! Could please send me the answers to all listening tests ?? could you send me the answer key? Can I see the transcript ? It is non-sense to not put the key and instead sending it by email! We hide the solutions at first to make you try your best for the practice test. It is an irresistible attraction to look at the answer key when you stuck at one question. Once you have spent time struggling with the test, we are willing to provide keys and further help if you need. Please take time to do the practice test first. HI, We have already sent you the solution for you. Please kindly check it! Any concerns, you can contact us!